Composed by Johann Sebastian Bach (1685-1750). Arranged by Steve Newman. Baroque Period, Repertoire. Piano Reduction. 31 pages. Published by steve newman (S0.291581). 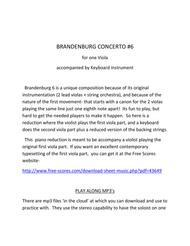 Brandenburg6 is a unique composition because of its original instrumentation (2 leadviolas + string orchestra), and because of the nature of the first movement- thatstarts with a canon for the 2 violas playing the same line just one eighth noteapart! Its fun to play, but hard to getthe needed players to make it happen. Sohere is a reduction where the violist plays the first viola part, and akeyboard does the second viola part plus a reduced version of the backing strings. 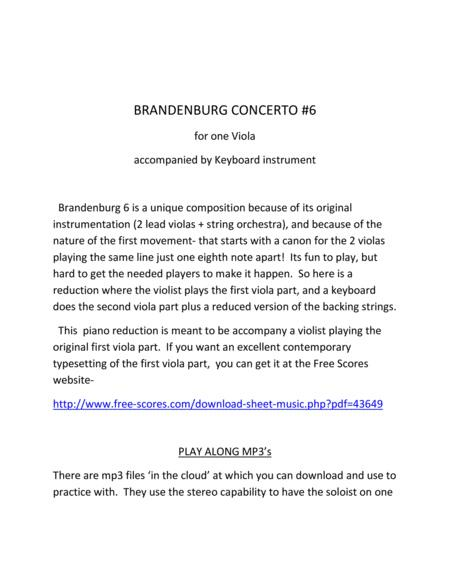 There aremp3 files ‘in the cloud’ which you can download and use to practicewith. They use the stereo capability tohave the soloist on one channel, andthe keyboard on the other. This way youcan tune out your part if you want, orleave it in, at a volume of your choice. The tempo of the ‘playalong’ tracks can be adusted to your choice by usingreadily available playback software for instance, Roni music-https://www.ronimusic.com/, or even websites that do it for you online. Also, even very inexpensive mp3 players in the under $20 range nowadaysprovide playback with adjustable tempo. xml filesare also available if you have a notation program and want to customize thescore or the sound files.